Renata was born on February 14th 1964 in Ljubljana, Slovenia. She graduated from the Faculty of Sociology, Political Sciences and Journalism and became a successful journalist on the popular Slovenian magazine JANA. Renata was diagnosed as bipolar and experienced periods of hospitalisation during her working life. She retired in 2003 and two years later published her first book Japajade,Tuma. Her second book, Depra was published in 2007 and became a best seller in Slovenia. An English version, published by Chipmunka Publishing, was launched at the University of Birmingham’s Centre of Excellence in Mental Health. Renata was a founder member of the Slovenian Movement for the destigmatization of mental diseases and disorder and offered workshops in therapeutic writing over several years in Slovenia and Birmingham for mental health service users and survivors. I was introduced to Renata on a sunny morning in 2005 on the Slovenia coast. The mutual friend who brought us together thought we would get on and we did. Renata had an established career in journalism, but had stepped away from the mainstream by writing the first book published about mental health from a survivor’s perspective- her own. We had a common interest in the lived experiences of people who had been given a psychiatric diagnosis. The vivid and engaging way in which Renata talked to me about herself, her writing and her desire to open up debates in Slovenia about mental distress left me wanting to learn more from her. When her book Depra was published in English by Chipmunka publishing in 2007 she came to Birmingham and launched it at the University of Birmingham’s Centre of Excellence in Mental Health (CEIMH). Following the launch and for several years she returned to Birmingham to hold therapeutic writing workshops for Suresearch. These brought together inspiring people with much to share and write about. Renata used to give her all during the days of a workshop and after was often exhausted by her giving, yet still found energy for winding down with food, drink and plans for our next meeting. Renata made lasting relationships with several of us Suresearch members and through her advice and encouragement members work was published in England and Slovenia. Two years ago writing from these Birmingham workshops appeared in a Slovenian book in which twelve authors who had experienced and survived psychiatric services, in Slovenia and England, wrote about their lives. I first met Renata in 2008. She gave a very practical demonstration of how to, in her words, write out the pain. I had already written an autobiography but she asked me to write a novel fictionalising the themes it had raised. She suggested that turning first person writing into a third person account created distance from previous painful life events. Renata taught me that re-reading my writing after a period of time created space from what I had written and would enable me to gain insight into my moods and chart my developmental journey of recovery. She was pivotal in enabling me to publish in Slovenia where she played a major role in promoting my autobiography. She seemed very proactive in having a genuine desire to attain and retain her wellbeing. Renata, I can’t believe you are no longer here-not in the flesh, but definitely in spirit and in our hearts. It is a great pleasure to have met you and to get to know you-even though it was for such a short time. I found you extremely easy to get on with from day one, when you first came to the Centre of Excellence here at Birmingham University, and ran a workshop for potential writers like myself. I loved your openness about your own life-your directives, e.g. ‘Don’t keep it all in your head, write it out’. This inspired me to do just that – I know others followed your lead. We set up our own Suresearch Writers and Readers group here at the University, to follow in your footsteps. It was a great privilege to share ‘my pain’ with you and other Slovenian and English service users- resulting in the publication of our joint book (still at the moment only in Slovenian) entitled ‘Write out Your Pain’. Renata, my heart is heavy with sadness about your end-but you will never be forgotten by many here at the University. In the introduction to Renata Azman’s highly acclaimed book, Depra, (Depression) (2007), her former psychiatrist commented on the difficulties involved in the process of Jungian ‘individuation’ and reaching of wider Self. It was observed that the journey for Renata and others before her was into challenging dark and difficult places as well as an experience of soul connection and realisation of the essential unity of all Being. In her struggle with long term manic depression the helpful effects of creative writing were a lived experience for Renata. She brought great warmth and compassion to her work with others in her therapeutic writing workshops. In Slovenia, her country of birth she shone a light through her books, articles and website on the hidden effects and costs of mental ill health, both to the individual sufferer and to society. On 14th February 2016, her 53rd birthday, that cost became all too apparent when she took her own life. She will be missed by many. Her message will I am sure live on in the hearts and minds of all those she inspired and helped in her battle to destigmatise and normalise mental illness in Slovenia and elsewhere. Renata’s writing workshops in Slovenia and Birmingham gave rise to an anthology including articles and poems by members of Suresearch (Write Out Your Pain, 2014). My own poem Cell Memories (2007), appeared on the last page of the book. The spontaneous writing of the poem had marked the culmination of a thirty-year journey of ‘individuation’ through various levels of psychological and spiritual awakening and awareness. It also heralded a fuller realisation for me of the lifelong personal impact and influences of complex PTSD and post traumatic spiritual development. 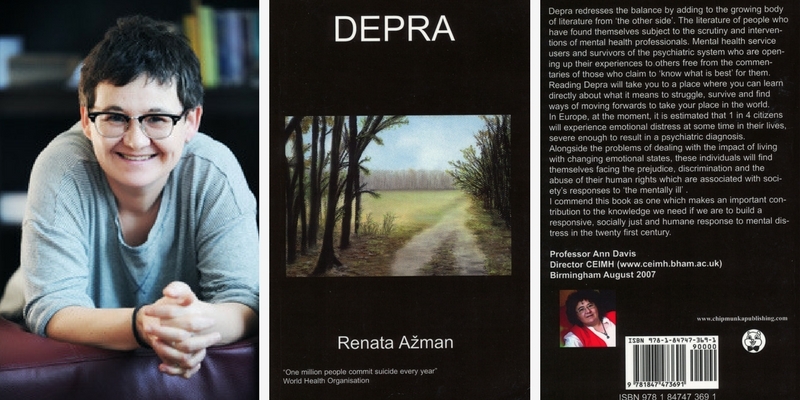 Renata’s book, Depra, is available in paperback and as an e-book, from Chipmunka Publishing.